Tha measgachadh de chùrsaichean ri fhaighinn do dh'oileanaich a tha fileanta ann an Gàidhlig. Tha cothroman ann cùrsaichean a dhèanamh anns a' Ghàidhlig ach cuideachd, faodar sgoilearan Gàidhlig a dhèanamh mar phàirt de chùrsa eile. Mar eiseimpleir, tha cùrsaichean ri fhaighinn ann an ceòl, eachdraidh, litreachais, teagasg agus mar phàirt de iomadach ceum eile. Tha cùrsaichean Gàidhlig ri fhaighinn aig na colaistean is oithighean a leanas. A range of further education courses are available to students who are fluent in Gaelic. There are opportunities for students to study Gaelic as their main subject or Gaelic can be combined with other subjects as joint degrees or qualifications. Courses are available in music, history, literature, teaching and Gaelic can be combined with a vast range of additional courses. 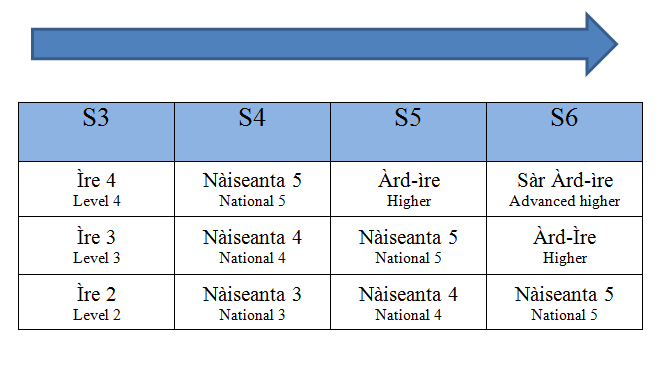 Gaelic is offered at the following collages and universities. Nuair a thig e gu cothroman air dreuchdan no obraichean, bidh cànan eile na buannachd gun teagamh. Tha barrachd is barrachd dreuchdan ann far a bheil Gàidhlig riatanach no co-dhiù feumail bho na h-ealain gu turasachd agus bho a' cuideachadh daoine gu poiligs agus an saoghal poblach. When it comes to career opportunities, an additional language is a very useful skill to have in the job market. There more and more careers where Gaelic is considered an essential or desirable skill from everything from the arts to tourism and helping people to politics and public life.